JPaaS development is funded by compatibleOne. “Many parties shared same set of resources, while giving each one his own space”*. A tradeoff between Sharing and Isolation. Shared infrastructure : Hardware might be shared (Virtualization / Cloud). 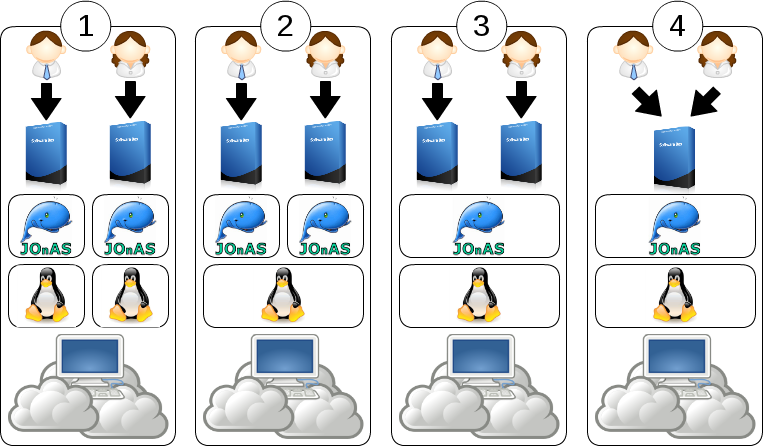 Shared operating system : One JVM/JOnAS per tenant. Shared applications server : One application instance per tenant. Shared application : One application for all the tenants. * WSO2 Inc. - Multi-Tenant SOA Middleware for Cloud Computing July 2010 - Srinath Perera, Ph.D., Architect.